The Latin name for peppermint is Mentha piperita. It is actually a hybred plant derived from crossing Water Mint and Spearmint. Mentha piperita has been bred and refined over the over the years to enhance its properties and become the plant we know today. Mentha piperita has been used as a part of herbal medicine tfor centuries. Mentha piperita is best know for its pleasant taste and fragrance. Mentha Piperita is a popular flavoring for foods, drinks and of course sweets such as chewing gum and sugar mints. Mentha piperita is also often used as a fragrance and essential oil. Peppermint oil has a multitude of health and medicinal uses and its use can be traced back for hundreds of years in traditional remedies. Mentha Piperita is also used to help ease the symptoms of a common cold, and is widely acknowledged to calm inflammations on the skin and to ease indigestion problems. In ancient Egypt, one of the most medically advanced cultures of thousands of years ago, they grew and consumed peppermint leaves as a natural remedy for indigestion. Romans and Greeks also took peppermint for indigestion and many of Peppermint’s health and medical uses have been verified by science. The most noticeable active ingredient in Peppermint is Menthol, an organic compound that produces a cooling and soothing sensation when applied to the skin. Menthol also acts as a mild natural anesthetic which makes it ideal for use in products that are used after painful waxing, sugering or shaving. Headaches, nerve pain, toothaches, inflammation of the joints and muscle pain are all potentially eased by the use of Peppermint. The main ingredient in Mentha Piperita creates a cooling sensation when applied to the skin. As a result it can temporarily reduce minor levels of pain associated with athletic injuries, muscle pain or other procedures such as hair removal and shaving. Mentha Piperita when combined with skin care preparations is capable of alleviating skin problems. Rashes, inflammation, redness and dryness of the skin are all eased. Mentha Piperita can be used in a hair rinse to soothe both dry and oily scalps leaving a cooling cleansed feeling. Infections, itchiness, allergic rashes and bacterial infections have all been shown to be eased by Mentha Piperita. Many people when using Aloeclear simply think that the peppermint smell is just that, a fragrance! That could not be more wrong… the cooling soothing and anti bacterial properties of Mentha Piperita make it a vital and active ingredient. While inferior ingrown hair products burn, sting and smell awful…. 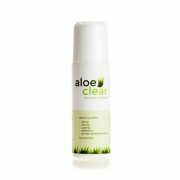 Aloeclear soothes, Calms and Cools, oh and with a delicious smell too!